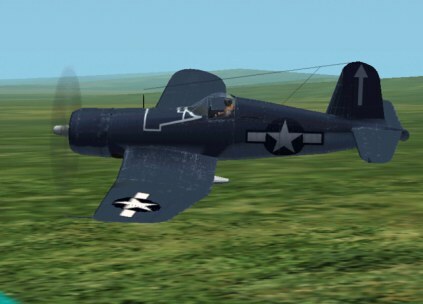 CFS2 Corsair repaint by Doug McNally, freeware. Repainted CFS2 stock Corsair by Doug McNally. Just for historical reference, the white "lines" on the forward fuselage in front of the cockpit is actually masking tape! It was used during the war to keep the fuel tank panels in place. (yep ... masking tape! Kind of unnerving, isn't it?) Freeware, and good freeware at that!